Configurations of the Real in Chinese Literary and Aesthetic Modernity. Leiden: Brill Press, 2009. 316 pp. This book argues that the literature of China in the twentieth century is the product of a local engagement with the global literary and aesthetic modernity that came out of Europe in the wake of capitalism to nestle everywhere, settle everywhere, and establish connections everywhere. For the most part, author Peter Button’s conception of what global literary and aesthetic modernity is, does, and means comes from Philippe Lacoue-Labarthe and Jean-Luc Nancy’s The Literary Absolute: The Theory of Literature in German Romanticism (1978; English translation, 1988), Marc Redfield’s Phantom Formations: Aesthetic Ideology and the Bildungsroman (1996), and Nicholas Brown’s Utopian Generations: The Political Horizon of Twentieth-century Literature (2005). Readers conversant with the approaches of Lacoue-Labarthe et al. will quickly see where Button’s general argument is heading. Readers–and, it must be said, some reviewers–who are not as well versed in theories of the literary absolute will have more work to do. It is worth it. This ambitious book is always engaging, often brilliant, and fantastically complex. Configurations of the Real makes a significant, three-fold contribution to the field of modern Chinese literary studies. First, it offers a new master narrative for understanding the emergence of modern Chinese literature. China, Button argues, was one stop on the global “eidaesthetic itinerary” (more about this term later), which is to say that in modern Chinese literature we find the same conjoining of literature, philosophy, and criticism, the same commitment to the central importance of aesthetic experience and judgment, the same effort to write into being a new modern subjectivity, and the same belief in the (post-)metaphysical power of literature to reveal the truth and make us free, that is found, mutatis mutandis, in all modern literatures. The complex of attitudes, practices, and institutions that we know as modern literature appeared in China, as it appeared elsewhere, because of the global reach of capital, because of the concomitant global reach of the romantico-modern concept of literature, and because of the agency of Chinese intellectuals. Button stresses that this was not a matter of West to East influence or Chinese reaction to somebody else’s modernity: Chinese writers and critics participated equally and fully in the creation of global literary and aesthetic modernity as they worked with the intellectual resources and problems that were presented to them by their particular position in history. In Lacoue-Labarthe and Nancy and his other sources, Button finds a theory of how the modern linkage of literature, theory, criticism, philosophy, and aesthetics comes to “generate everything from New Criticism and socialist realist theory to all varieties of poststructuralist literary theory” in both East and West (27). In other words, the theory of the geopolitical movement of the idea of the literary absolute in the wake of global capitalism explains everything: it explains the literary theories and/or practices of Walt Whitman, Lu Xun, Mao Zedong, John Crowe Ransom, Cai Yi, C. T. Hsia, Yang Mo, author of Song of Youth (1958), and Luo Guangbin and Yang Yiyan, co-authors of Red Crag (1961); it explains the nature of modern Chinese literature; and it explains the nature of the North American critical engagement with modern Chinese literature. Button’s theory of the Chinese literary absolute–his theoretical explanation of what drove Chinese configurations of the real in literature in the first half of the twentieth century–allows us to see qualities of modern Chinese literary texts and relationships among texts and institutions that we have thus far missed. Button’s work on the Chinese literary absolute, in other words, has the same heuristic import as the theories of “the obsession with China,” “the limits of realism,” and fictional realism and “the monster that is history.” It is, apparently, intended to supplant those theories. An analysis of the nature of, and the reasons for, what Button sees as Hsia’s inability to comprehend the real nature of Chinese literary modernity is a major preoccupation of the entire book, and the first chapter includes a closely-related critique of the work of Marsten Anderson and David Wang. This leads us to Button’s second thesis, which is that North American studies of modern Chinese literature have failed to identify and account for the true nature of Chinese literary modernity because of the post-World War II “institutionally enforced oblivion” (12) to the modern continental philosophy that has been translated into Chinese and assimilated into China without cease since the late nineteenth century. 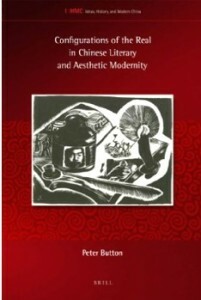 The modern philosophical concept of the aesthetic figuration of the human has always been of central importance in Chinese literature and criticism, Button argues, and we find this to be so in Lu Xun’s “The True Story of Ah Q,” in the work of Cai Yi in the 1940s and 1950s, in socialist realist novels, and in Li Zehou’s 1979 A Critique of the Critical Philosophy: A Commentary on Kant. This argument of Button’s, which draws on and extends earlier work by Liu Kang and others, is persuasive and illuminating. Button is not quite as thorough in making his case that because the field of North American Chinese literary studies was “formed under the New Critical Orientation of C.T. Hsia” (30) we were cut off from the intellectual resources of (mostly German, significantly Marxist) continental philosophy and therefore slow to catch on to the importance of “Western theory” to Chinese literature. Button writes at length and with great insight about the critical orientation that informed Hsia’s A History of Modern Chinese Fiction (1961), but he does not discuss the history of North American Chinese literary studies in sufficient detail to justify his conclusions about the conditions of our institutional formation (279). Button, in fact, comes close to reducing everything to Hsia, his defender Michael Duke, and one of his “keenest admirers” David Wang, on one side, and Liu Kang and Hsia’s other critics, on the other side (20). Button discusses the work of only a small number of North American-based scholars–Hsia, Anderson, David Wang, Tang Xiaobing, and Michael Duke–and while his critique is cogent, it does not justify his suggestion that Hsia’s influence over the entire field lasted until the mid-1990s, when scholars such as Liu Kang and Wang Ban finally brought an end to our neglect of Chinese Marxist aesthetics and introduced us to a more theoretically complex and more true understanding of Chinese modernity (30-31, 140). Button’s specific analysis of the onto-theological assumptions at work in Hsia’s History is, however, highly original and extremely interesting. Button’s argument that Hsia shared a critical ethos with Mao Dun (both aspired for Chinese literature to attain affirmation as world literature of universal significance) and the Marxist theorist Cai Yi (both believed art could rescue human integrity from the damage done by modern positivism and science) is also fascinating. Button’s ultimate purpose in his discussion of Hsia, however, is to offer a reason why Hsia misread and dismissed socialist realist novels: he was looking for something that socialist realist fiction by definition could never contain, and so he was blind to the essence of that fiction and also blind to the fact that this fiction was built upon some of the same theoretical assumptions that supported his own New Criticism. This brings us to Button’s third and most important argument: social realist texts exemplify “China’s installation of the modern concept of literature” (278). Button argues that Chinese socialist realism “realizes a form of literary modernity in an especially consequent and trenchant manner” in that its “most insistent content” is comprised of “the overarching thematics of modernity: ‘History, Consciousness [. . .]Will, Freedom, Art, Man'” (8, 237). Button argues that socialist realist theory and socialist realist literature take up “the most fundamental tasks of modern humanism in the wake of the abyssal conditions of modernity” (51) by trying to work through all the difficult problems of “the real, ideality, essence, phenomenality, materiality and spirituality” (175) that have been the preoccupation of global literary modernity since the nineteenth century. In short, in Button’s analysis “The True Story of Ah Q” leads directly to Song of Youth and Red Crag (6, 161) and the diverse, creative, and complex Chinese engagement with global literary modernity “partially culminates” in socialist realist literature (x). Button has no interest in discussing or defending the literary merit of socialist realist literature; in any case, literary merit, Button would likely argue, is an entirely subjective and historically determined notion and so immeasurable and ultimately inconsequential. Button instead mounts a vigorous defense of the intellectual sophistication and moral integrity of Marxist dialectical materialist literary theory as practiced by Cai Yi (1906-1992) in books published between 1943 and 1962. Button shows that Cai Yi was working on the same set of problems that occupied other more well-known thinkers at around the same time, including Heidegger and John Crowe Ransom (who taught Cleanth Brooks who taught Hsia); and he argues that it is only when we acknowledge the intellectual resources upon which socialist realism drew (e.g., Cai Yi’s theories), and only when we take seriously the claim that socialist realist texts engage “issues of philosophical and aesthetic substance,” that we can we understand these texts (202). The argument in Configurations of the Real about the development of Chinese literary modernity is mostly diachronic, but it is also at times synchronic, with Button showing, for example, what is common to the literary thought of Walt Whitman and Mao Zedong. And at other times Button builds his argument back to front, with, for example, discussion of C. T. Hsia’s blindness to the essence of Chinese socialist realist fiction coming before an explanation of what that essence is. Button’s book is also wide ranging and theoretically dense, and, readers of this review should be cautioned, very difficult to summarize. Drawing on Lacoue-Labarthe and Nancy among others, Button reminds us that in Jena, Germany, between 1798 and 1800, Friedrich and August Schlegel and their colleagues were keen to finish work that Kant had started. The Jena Romantics regarded Kant’s idea of the subject as incomplete, because while Kant’s subject was free, it could never become absolutely free because it was not and could not become conscious of itself. It works like this: the essence of the Kantian subject is freedom; the Kantian subject can know itself only through “sensible intuitions,” freedom is not something that can be so known, and therefore the Kantian subject cannot know itself. The solution was to present the idea of freedom, which is the essence of the subject, in the form of art that becomes the “object of cognitive experience” (76-7). For the Jena Romantics, in other words, the subject could be completed through art, and in particular through literature, and in particular through a kind of writing that was all aboutBildung (formation). To put this differently, when philosophers were philosophizing what it was to be a modern human and how it was that one could become a modern human, they hit upon an idea that still influences us: the modern, free subject wrote itself into being in literature. This, Button argues at length and in complex detail, is what socialist realist fiction is all about. A second key to Button’s argument is the assertion that in the modern concept of literature, philosophy, literature, and literary criticism are not just linked but are the same thing. In the project of modern literature, aesthetics moves front and center and, to quote Button quoting Marc Redfield, “‘partakes of the emergence of the universal subject of bourgeois ideology'” (17). This idea is the idea of “eidaesthetics,” a term coined by Lacoue-Labarthe and Nancy in their Literary Absolute and “meant to encompass the unique way the aesthetic as art is called upon to present the unpresentable, namely the Idea of freedom as the subject’s identity.” In other words, the “philosophical Idea (eidos)” is presented in the “realm of art (aesthetics)” (44). This idea, which is constitutive of the entire concept of modern literature, sets off on a global eidaesthetic itinerary (the term is Nicholas Brown’s) and spreads around the world hand in hand with capitalism (xii, 124). Button quotes Marc Redfield to explain that, as the complex of ideas and practices that goes under the name “eidaesthetic” reproduces itself around the world, we get “the transformation of the artist into a genius, the representative of universal humanity whose productions transcend the system of commodity exchange which enables them” (17) and we–C. T. Hsia, Cai Yi, all of us–begin look to literature, fiction in particular, for revelation, guidance and inspiration, and insight into the essence of human being, and, not coincidentally, we build the institutions of academic literary criticism. There is more to it. There are, crucially, more terms to it, namely, onto-theology, onto-typology, type (dianxing), and image (xingxiang). Button argues that Hsia, like every other modern global literatus, believed in the importance of the aesthetic and the power of art to figure the truly human (Hsia had to believe this, the global eidaesthetic itinerary encompassed him too). In the case of Hsia and his criticism, Button argues, the problem of the essence of the human is answered with onto-theology and “metaphysical moralizing” (32, 121). Onto-theology is one way to answer the question, Who are we, really, and how do we know ourselves? The onto-theological conception of human being and human nature is a metaphysical theory of the human that throws ups its hands at the question of Being, asserts a permanent, universal human nature, and claims that only God knows what it is all about. The question of Being, in other words, is answered with theology. In Chapter 19 of his A History of Modern Chinese Fiction, Hsia writes, “The superficiality of modern Chinese literature is ultimately seen in its intellectual unawareness of Original Sin or some comparable religious interpretation of evil” (page 504 in my edition of Hsia’s book). This, Button argues, is our best evidence that Hsia’s criticism is grounded in part “in an onto-theological conception of human being” (121). Button argues that, as Hsia saw it, modern Chinese literature in general failed because it did not acknowledge the unknowable mystery of human being, and Chinese socialist realist fiction failed in particular because it believed in the perfectibility of human being and was blind to the real nature of human evil. Button is neither as quite as meticulous in his use of the evidence of Hsia’s Original Sin comment nor quite as clear in articulating an argument on the basis of this evidence as one might like. In the body of his text, Button argues that C. T. Hsia believed Chinese writers were doomed to a shallow understanding of the human condition because “they lacked a concept of Original Sin” (31). The rest of Hsia’s sentence–“or some comparable religious interpretation of evil”–is relegated to a footnote. When Button refers to Hsia’s concept of Original Sin in the body of his text, it is always without Hsia’s qualifying clause, which Button dismisses, also in a footnote, as if it is a prima facie truth that Hsia couldn’t have had a Buddhist or Confucian or any other Chinese religious notion of evil in mind (126). This allows Button to suggest that Hsia believed that “absent the specifically Christian conception of Original Sin, neither Chinese nor Western writers could produce great works of literature” (32-3). This further allows Button to argue that Hsia was introduced to the problem of Original Sin in literature in a course with Cleanth Brooks that included readings from Allen Tate and John Crowe Ransom. These readings “addressed the relationship between modern literature and (Christian) humanity’s fallen condition” (33) in a way that would be strongly echoed in Hsia’s History. And this finally allows Button to trace the genealogy of the concern for the lack of a Chinese belief in Original Sin–including Hsia’s own concern–to Arthur K. Smith and his Chinese Characteristics (34). A frustration, however, is that Button does not write that Hsia believed Chinese writers couldn’t write great fiction because they didn’t believe in Original Sin; he writes that there is “the inevitable sense” that Hsia believed this, but who intuits this sense and whether or not it is a valid sense is left unclear. Button does not write that Hsia was introduced to the problem of Original Sin by Brooks; he writes that “It is difficult not to conclude” this. Button writes that Hsia’s History and Smith’sChinese Characteristics are alike in moralizing about “the godless state of the Chinese soul” but this assertion of a sameness between Hsia and Smith appears as the given in a sentence that is about the difference in the “tenor” of the two works, which means that Button does not need to argue that Hsia was concerned that the Chinese didn’t know the Christian God, he simply assumes it (35). Remembering that Button takes Hsia as exemplifying an entire field of academic study, and turning the steps of the above argument around to begin with Smith, it is difficult not to conclude that Button is suggesting that the institution of North American Chinese literary studies is grounded on “the [Christian] West’s onto-theo-logical diagnosis of China’s spiritual deficiency” (35). There is the sense that Button realizes the enormity of this claim and so stops short of making it directly. It seems to me, however, that this claim is crucial to Button’s argument that the field of North American Chinese literary studies has dismissed, marginalized, or misread Chinese socialist realism precisely because it somehow reveals “the conditions of our own institutional formation” (279). This critical point of Button’s makes sense to me only if we accept that the field held on to onto-theology while in China Chinese literature moved on to onto-typology, which term is explained below. Button is very clear in arguing that onto-theology not only informs the thinking of C. T. Hsia but is the “ideological unsaid” in Hsia’s work (10) that made it impossible for Hsia to “grasp how his leftist counterparts conceived of literature” (23). Hsia’s leftist counterparts conceived of literature in terms of onto-typology, not onto-theology. Onto-typology–the term is Lacoue-Labarthe’s–is the corollary of the onto-theology of Hsia and the American New Critics with whom Hsia studied, and also of Arthur K. Smith (xii, 32). “At its most abstract,” Button writes, “onto-typology can be understood as the logic of the Being of the subject which grants meaning through forming itself into a figure” (172). Onto-theology becomes onto-typology when it is “inverted and ‘turns around into’ a rescendence in the modern (post-)metaphysical figure of human essence” (162). Freud’s Oedipus, for one example, is a figure and so, for another, is Nietzsche’s Zarathustra; each is the projection of an Idea, the projection of an untestable truth that hides its (post-)metaphysical origins (122). “Figure” is another word for “type,” and “type,” Button says, with amusing understatement, is “rather more complex a concept than most mentions of it are willing to imagine” (199). Readers may turn to Button’s book for a full account of this complexity; here I will be content merely to say that Button establishes that the notion of the type–and the discourse of onto-typology–spreads around the globe with capitalism, appearing “insistently” in all modern world literatures and criticism (159, 199). Moreover, the notion of “type” is an integral part of the modern assumption of a humanist universality: the type represents the universal. Button is most interested in how the notion of the “type” arrives in China and in how, after its arrival, it is reworked by Lu Xun in practice and by Cai Yi in theory. The notion of “type” arrived in China in two forms, one informed by Christianity and one not. Both were articulated in texts that ended up in Lu Xun’s study: Smith’s Chinese Characteristics; and Nietzsche’sThus Spoke Zarathustra and Mikhail Artsybashev’s “The Worker Shevyrev.” Lu Xun may have read Smith’s book as early as his student days in Japan, and he maintained an interest in it for the rest of his life. Button argues that Smith’s book is the origin of “the discourse of Chinese national character” (36). For Smith, the Chinese, because they do not know the Christian God, are characterless, soulless or, in other words, Button writes, Bild-less, with Bild meaning “image,” “copy,” or “model” (105, 274). In a complicated argument that he spreads among the introduction, the second chapter on Lu Xun and “Ah Q,” the fourth chapter on Cai Yi, Heidegger, and Whitman, and the conclusion, Button contends that Smith’s notion of the Chinese lack of character, Hegel’s expulsion of the Chinese from history, Whitman’s nationalism, and American Yellow Peril fiction are all predicated on the modern logic of the universality of the fully and properly human that can be figured as type and that produces in the West the notion of the “anti-type,” or what Button calls the “para-human.” Following Button as he makes connections among his primary and secondary sources to explain why the notion of the “type” in the West of necessityproduced a notion of the “para-human” and how that notion is different from ordinary Orientalism or racism is difficult (166-76). Button’s argument about what happens in China is easier to track, perhaps because it is more streamlined. In China, Button argues, the modern logic of universality was internalized and along with it so was the idea of “type,” but Lu Xun, Mao Dun, and later Cai Yi rejected the onto-theological assumptions of this logic–specifically they refused the Christianity of Smith–replacing it with an onto-typology that Lu Xun in particular took from Nietzsche and that Cai Yi articulated from an explicitly Marxist perspective (174, 36). Button writes, “Smith’s book on national character opened up the problem of the human soul and in its place in China, a (post-)metaphysical Marxist discourse of human essence (Gattungswesen des Menschen) emerged to fill in that discursive space” (161-2). Chapter 4 of Configurations of the Real argues that Lu Xun’s early fiction was a “symptom” of the installation in China of the literary absolute, though in this case Button calls it “aesthetic ideology” (86). Button observes that in the space of two years, Lu Xun translated the prologue of Zarathustra, introduced, in an essay on Artsybashev’s story, for the first time in print in China the term dianxing (type), and published “The True Story of Ah Q,” which gave China its first literary type (87). Button offers a close reading of “Ah Q,” arguing that it is “a literary retort to Smith,” and argues that in creating the character of Ah Q, Lu Xun drew on the “vast gallery of types” in Zarathustra, which we know Lu Xun read, and also in Ecce Homo and On the Genealogy of Morals, which he is likely to have read (115, 109, 101). Button, building on the work of Lydia Liu and in part contesting previous arguments about Lu Xun’s use of Nietzsche, argues that in “Ah Q,” Lu Xun does not intend to represent the Chinese national character/type; he is out instead to critique the very discourse of national character/type. Lu Xun does this, Button seems to argue, by making Ah Q into a “gruesome hybrid” of “sickness and will to power” and by telling his story in the voice of a narrator who is not only unreliable, as has often been observed, but is also homodiegetic or, in other words, part of the world he falsely claims to command omnisciently. Button’s account of what Lu Xun does in the story is not as clear to me as his account of what Lu Xun undoes, so to speak. Lu Xun’s story, Button suggests, cancels the sort of totalizing, onto-theological claims that are found not only in Smith but also in Chiang Kaishek’s New Life Movement (99, 113, 116). Button argues that while Lu Xun’s story rejects the Christian assumptions of Smith it still appeals to a “form of metaphysical” in “the figure of Man as species-being and type” (116). However, I read Button’s complex analysis of “Ah Q” as suggesting, to the contrary, that Lu Xun was aware of something that Cai Yi, working two decades later, was unaware: Lu Xun recognized that onto-typology did not escape metaphysics. Cai Yi studied at Peking University in 1925 and then in Japan; he published a novel in 1931, and then after 1941 devoted his career to the application of dialectical materialism to the study of Chinese aesthetics. In part of chapter 3 and in chapter 4, Button walks his readers–at what seems to me to be too rapid a pace with too many detours–through Cai Yi’s efforts to provide “a rigorous philosophical grounding” for the concept of “type” (162). The keys to Cai’s work, Button argues, lie in his analysis of “type” (dianxing) and his related ideas about “image” (xingxiang). In Button’s analysis of Cai Yi’s theories, the latter term seems to have two meanings. First, “image” is the language of art; in art we think in images, and this thinking, or “mode of reflection,” is distinct from–and for Cai, one infers, superior to–the “theory” (lilun) of science (151). For Cai, science is shorthand for “the eviscerating ravages upon the ‘full substance’ of the human wrought by modern capitalism’s instrumentalist conception of human reason” (128). This, I mention in passing, is where, Button argues, Cai Yi the Marxist and Hsia the New Critic are exactly alike; the difference is that Hsia saw Communism not as a solution to positivism but rather as its absolute–and immoral–culmination. In Cai’s dialectical materialist theory of aesthetics, which tries to think its way toward an articulation as to how the full substance of human subjectivity can be represented in art, the artistic image is simultaneously concrete and particular, revealing the universal through the individual, and “able to arouse sensation within us” (156). The second meaning of “image” is, somewhat confusingly, “type”: Button quotes Cai Yi as writing that the “concrete, individual image is precisely the artistic type” (191). “Cai attempts,” Button writes, “to make good on the promise of providing a dialectical materialist means of grasping the typical in reality as the basis for producing exemplary artistic types in the work of art” (177). I have not read Cai Yi’s work, but judging from Button’s account, Cai’s attempt fails. To say, at length and in various ways, that something happens when a “truly great artist” such as Shakespeare creates a type such as Hamlet and that a writer’s observations of “a specific class of a specific nation at a precise time in a given era” may produce a character who will “fully and typically manifest the essential conditions” of the given age does nothing to explain exactly what happens or how it happens (194). Much less, apparently, was Cai Yi able to imagine, for illustrative purposes, a new type remotely as powerful as the existing types he was able to recognize in literature. Button writes that the “type represents a special class of things that reveal the essence (universality) of the thing,” which sounds good. Then, however, Button cites Cai’s example: “Lisi [sic] is a typical revolutionary. . . . Li Si possesses all of the requirements of a revolutionary and these requirements figure prominently in his character” (181). Button writes that Cai “admits that this example is not entirely adequate,” which is another understatement, but “it does offer the sense in which an individual (person, in this case) as existing in social reality is capable of manifesting the universal” (181). Here Cai is writing about the identification of “type” in reality, which is not even the end of the process of artistic image thought and typification. The end comes in “intensification”; the artistic type is “higher, more complete, more typical” than the “type” in reality (183). Again, exactly how this is supposed to happen is left unsaid. Button’s account of Cai Yi’s theory is disinterested–it is without bias. My impatience with Marxist theories of the typical is evident in the above paragraph, I am sure. Button may find my impatience to be beside the point. Button’s disinterest serves his purpose, which is not to debate the merits of Cai’s theories but first, to clarify Cai’s purposes. Button argues that Cai “sought to align Chinese Marxist cultural theory with key elements of modern philosophy.” Button’s second, larger, related purpose is to demonstrate Cai’s “participation in the global project of modern eidaesthetics” (178). The reach of this project across time and space and ideologies explains, for example, why “much of [Marxist] Cai’s early work [from 1941] reads like a theoretical elucidation of the aesthetic project of [American nationalist] [Walt] Whitman’s Democratic Vistas ” (190). Button writes that Cai believed his dialectical materialist aesthetics constituted a critique and an overcoming of metaphysics that would create a “solid ontological foundation for the artistic creation of types” (178), but for the most part, just as he allows his readers to come to their own conclusions about dialectical materialism and the theory of the “type,” Button likewise allows his readers to come to their own conclusions and make their own judgments about Cai’s beliefs. Button’s consistent use of the term “(post-)metaphysical” to refer to Cai’s theories, however, and several comments throughout the book suggest that Button accepts that Cai’s belief was more a faith. In his final two chapters Button argues that Cai’s dialectical materialist aesthetics–his theories of “image thought” and “type”–not only inform Song of Youth and Red Crag but are necessary to a full understanding of these novels. Of the former work, Button writes that we must take seriously the novel’s “claim to describe the experience of a commitment to the truth embodied in Marxist-Leninist dialectical materialism” (203). The novel, Button suggests, both is and is about a dialectical materialist aesthetic engagement with the world that intends, through the figuration of “types” and through “image thought,” to write into being a more free universal human subject and imagine a “truly humanized political order” (205). Button suggests that each particular narrative detail in the novel can be shown to be a specific embodiment of an element of the novel’s general philosophical premises. He argues, for example, that Lin Daojing’s “rapture” at the sight of the ocean and her conversation with her porter about that ocean demonstrate that “Lin’s dialectical progress requires that she first embrace . . . [a] politically retrograde and essentially Kantian conception of the beautiful in order that she later come to realize its failures and embrace the revolutionary vision of beauty” (206). Button goes on to elaborate an extremely interesting argument that the novel is, in the end, about the “political stakes of beauty” (205). Red Crag was written by survivors of a massacre at a concentration camp run by the Sino-American Cooperation Organization (SACO) and is about revolutionary struggle in the concentration camp, in Chongqing, and in the Sichuan countryside in 1948-1949. According to Hong Zicheng, the novel “can be safely said to be the best-selling novel of contemporary times” (A History of Contemporary Chinese Literature, 127), which is support for Button’s argument that the field of Chinese literary studies in North America has not given socialist realist fiction the attention it deserves: Button offers what seems to be the first full discussion in English of Red Crag since Joe C. Huang’s 1973 Heroes and Villains in Communist China. Button pauses to argue that the novel has contemporary relevance because the events it narrates are currently the subject of contentious revisionist historiography in both China and the U.S., but the balance of his discussion of Red Crag is devoted to arguing that “the philosophemes surrounding the problems of human subjectivity, (Marxist-)Hegelian dialectical negativity, and human species-being from the early Marx” all “circulate” within the narrative of the novel (238). Button begins and ends his reading of Red Crag by arguing that it is best thought of as a revolutionary Bildungsroman, bringing us at last to the term that is the linchpin of Button’s argument. In the last six pages of his book, Button, as if turning over a trump card, draws on Redfield and Gadamer to argue that Bild has a “mysterious ambiguity” and can mean “both Nachbild (‘image,’ ‘copy’) and Vorbild(‘model’)”; he then offers that xingxiang translates into German as “Bild” and English as “image,” “form,’ or “figure”; he next notes that Vorbild (“model”) is German for what is in Chinese dianxing; and finally he argues that this nexus of terminology explains the importance of the terms dianxing and xingxiang to Chinese Marxist literary theory: everything that is of central importance to the Chinese Marxist assimilation of the modern literary absolute, Button suggests, is loaded into these terms/concepts (274). I take this to mean that image thought is figuration is modeling is formation through aesthetic experience and judgment of the modern individual-as-universal free human species-being. Therefore Bildungsroman, Button argues, is the perfect term for not only a novel about the subject-formation of a young woman, as in Song of Youth, but also Red Crag, which Button seems to say, in an argument entirely too elaborate for summary, is about the “auto-formation” of the revolutionary subject of the reader (276). The Chinese socialist realist Bildungsroman is, Button argues, the “literary vernacular modernist text, par excellence” (165). I have three reservations about the way in which Button constructs his argument. First, in at least two places he asserts an almost teleological literary history. He writes of “a certain historical inevitability to the creation of Chinese social realist Bildungsroman(e)” (39) and that “Early May Fourth realism embarked Chinese literature on an itinerary that, once wedded firmly to modern eidasthetics, arrived very much of necessity at . . . socialist realism” (278). I do not understand what Button intends by this language. I find it difficult to accept, for example, that there was anything inevitable about the crafting of Red Crag, which, as Hong Zicheng explains, took ten years and the participation of a Party-led committee of editors before the manuscript was deemed to have met what Hong calls “a unitary ideological goal” (A History of Contemporary Chinese Literature, 129). Much less do I understand how literary history can be said to have an inevitable destination. Second and relatedly, while Button stresses that his purpose is not to endorse “the supposed ideological content” (203) of the fiction he discusses, his dispassionate tracing of the appearance of the notion of the literary absolute in the work of critics separated by gulfs of ideological and cultural difference clashes with his intermittent but unmistakable advocacy on behalf of the purity of intent in Cai Yi’s work and in socialist realist fiction. I find some of what Button argues as an advocate to be convincing: I can accept, for example, that for Cai Yi socialist realist literary production was supposed to be “an open-ended engagement with an objective materiality whose essence can never be known in advance” and not a close-minded effort to deliver political dogma made palatable by embedding it in stories of romance or patriotic heroism (158). But on the other hand, Button does not acknowledge that the method of the production of Red Crag alone is more than enough evidence to demonstrate that Cai Yi’s hopes for socialist realism were not realized. At times, Button’s interest in defending socialist realism against its detractors leads him to make claims that are difficult to process. For example, Button argues that in his remarks about typicality in his 1942 “Yan’an Talks,” Mao was engaging the “modern (post-)metaphysical resources of onto-typology,” but Hsia was “compelled to completely recast Mao’s comments as a bid for totalitarian control of the literary scene because, symptomatically, Hsia [in writing about Mao] has touched upon an area in which he shares the most with Mao” (197, 135). A more reasonable conclusion might be that, granted Mao may have been engaging in what Button says he was engaging, nevertheless at the same time he was surely not so much bidding for as actively taking control of as much of the literary scene as he could. Hsia wasn’t recasting Mao’s comments, I would argue, he was taking them quite literally. Third and fourth, any argument that attempts to explain the essential nature of the entire Chinese literary modern must have something to say about the importance–or lack thereof–of indigenous literary and critical resources and also must address in detail more than three primary texts. Configurations of the Real is essential reading for any scholar hoping to understand the discourse of aesthetics in modern China; it offers an original reading of Lu Xun’s “Ah Q” that is likely to change the way we understand not only this story but also Lu Xun’s engagement with the writing of Nietzsche; and its overall argument about Chinese socialist realism and its specific analysis of two of that genre’s most popular novels should encourage, guide, and challenge further work on what Button’s argues, rightly in my view, is a too-long neglected corpus of very interesting literature that is connected in direct fashion to all of the rest of modern Chinese literature.